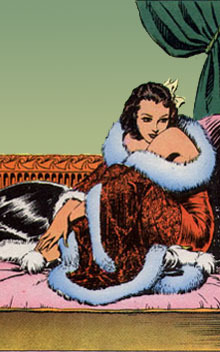 Queen Fria was Alex Raymond's last femme fatale before World War II. 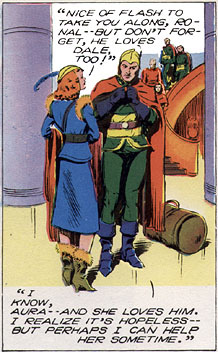 As Prince Barin's new ally and guest of honor, Fria is dressed to the Nordic Nines, and played by Luli Deste (Luli von Hohenberg) in the serial . 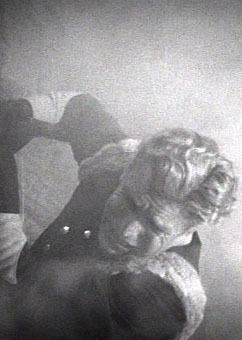 Raymond's Frigian monarch was just plain HOT, despite her frozen realm. 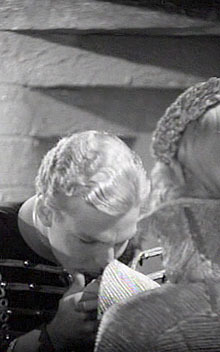 Dale's justifiable jealousy was a recurrent theme in the Ice Kingdom adventure. 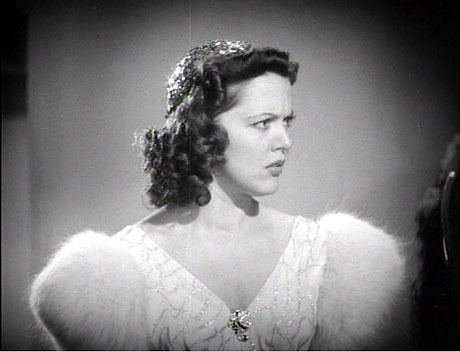 But Dale Arden doesn't like it ONE BIT. 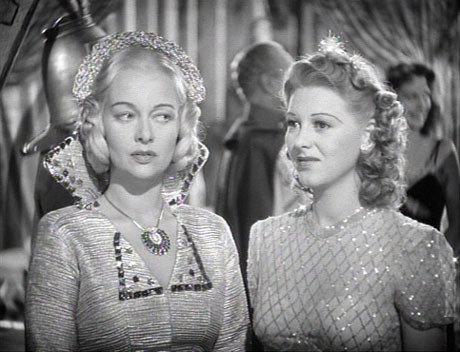 Beautiful Carol Hughes' jealous double-take repeats itself again and again in the movie serial. Dale and Fria did a pathetic triangle with an oblivious Flash in the papers. 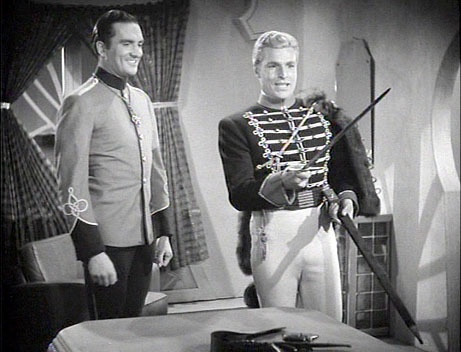 Ronal is a character from the past, who isn't in any previous movie, as if Hollywood relies on its audience knowing Flash Gordon's Sunday adventures. Ronal had a ridiculously unrequited crush on Dale Arden in the strip. 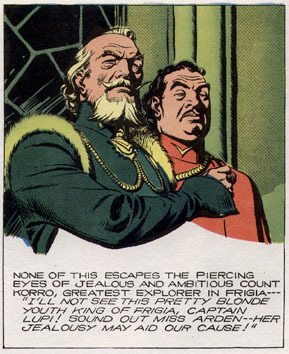 Frigia was the scene of Flash Gordon throughout 1939 in the Sunday pages. 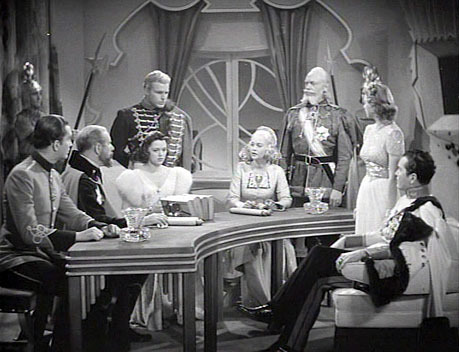 Queen Fria and Prince Barin are plotting against Emperor Ming in 1940, when Zarkov, Dale, and Flash join them to halt the Purple Death plague. 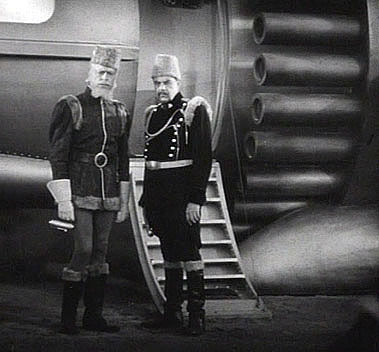 Count Korro and Capt. 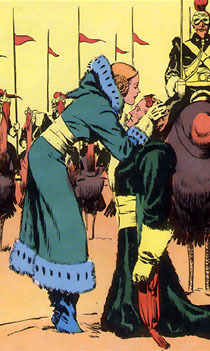 Lupi were also featured in the comic strip, but as secret enemies of Flash. 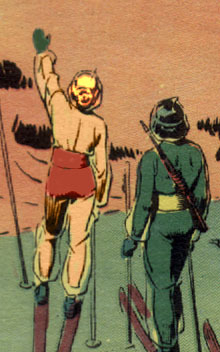 Korro (L) makes a daring raid with his allies on Ming's citadel to rescue General Lupi (R) from execution by Purple Death Dust. 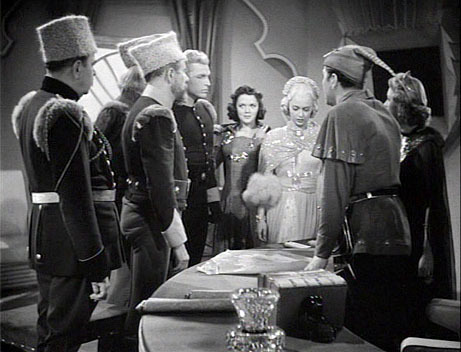 The filmmakers at Universal Pictures in 1940 sometimes borrowed ideas from 1934, the earliest days of Alex Raymond's comic strip. 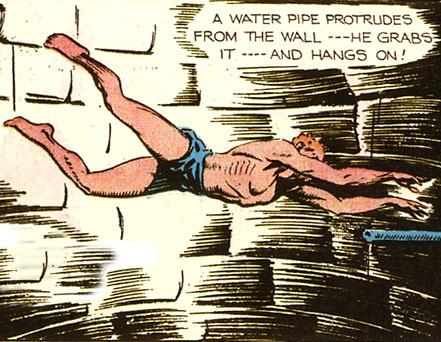 Flash needs rescuing in the first cliff hanger Uh -- pipe hanger between episodes. The raiders all survive, but Queen Fria exits the serial at the start of Chapter 2, to Dale's smug delight. 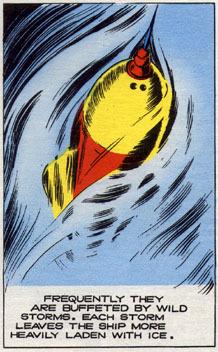 The Earthlings lead an expedition to the wilds of Frigia. 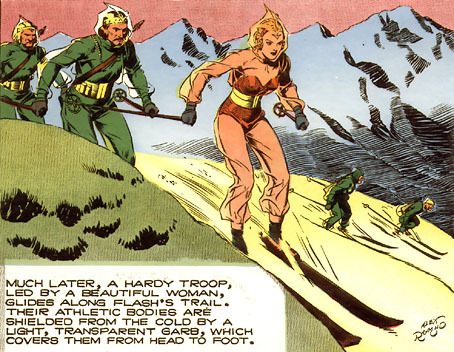 Fria always led HER soldiers through HER domains in the Sundays.